Connecting mobile devices to the Internet is playing a bigger role in luxury car sales. 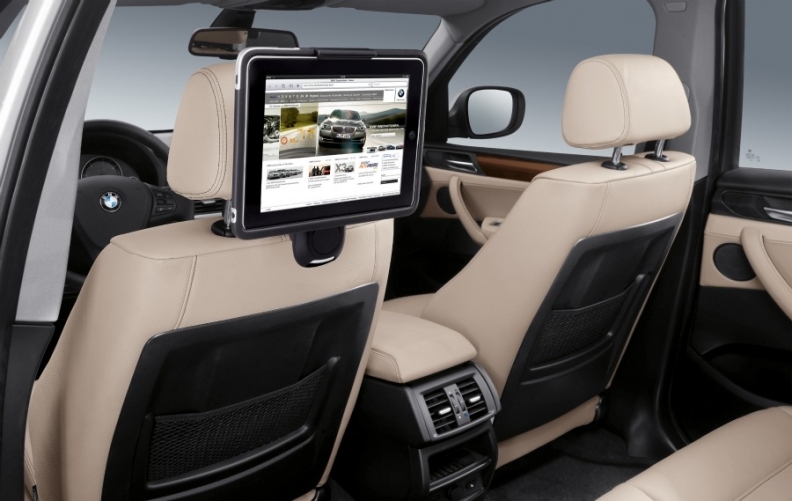 Pictured is BMW's iPad holder. MUNICH -- BMW is bringing Twitter and Facebook to the 5-series sedan as luxury auto brands play catch-up to Ford Motor Co. in the race for tech-savvy drivers. BMW and Daimler AG's Mercedes-Benz are adding Internet and smartphone access to their vehicles as environmental concerns and consumer addiction to mobile devices shift the emphasis to high-tech gadgetry from horsepower. "Mobile connectivity is playing an increasing role in all our lives," BMW sales chief Ian Robertson said at an event in Munich. "These services will continue to grow. It's a component of a competitive advantage." Luxury automakers were slow to link their cars to the Internet because of concern about safety and allowing unfiltered data into their vehicles. The proliferation of mobile devices like Apple Inc.'s iPhone is changing that, while oil prices above $100 a barrel increases pressure on carmakers to find a selling point that isn't associated with burning fuel. Mercedes began offering Internet access in vehicles for the first time this year with the upgraded C class and revamped SLK roadster. BMW last month introduced a smartphone application that allows iPhone users to access playlists and browse tweets from the car's display. Audi will add real-time traffic data to its navigation service in Europe this summer. "Luxury automakers were keen on controlling the flow of information in the car to preserve the brand experience, and that slowed down the rollout of services," said Anil Valsan, an analyst at Ernst & Young's automotive center in London. "The high-end vehicle market can't afford to lag anymore." Ford provided connection to mobile devices when it launched Sync in 2007. The system, developed with Microsoft Corp., plays music on voice command and reads tweets to drivers. Sync, which will be rolled out to Europe next year, has gained more than 3 million subscribers in North America. General Motors Co. began offering the OnStar service in 1995. The system, which provides emergency support, navigation help and stolen-vehicle assistance, is available in more than 30 models in the U.S. and has more than 6 million users, Vijay Iyer, a GM spokesman, said in an e-mail. Luxury automakers, which traditionally have been in the forefront of integrating technology into their vehicles, are facing greater competition from mass-market competitors in networking, said Jesse Toprak, an industry analyst with TrueCar.com, a Web site based in Santa Monica, California, that tracks auto market trends. Brands like BMW and Mercedes have to prove they're worth the higher price and connectivity offerings are playing a bigger role, he said. "Along with the name, people are paying for the technology in the car," Toprak said. "If you can get the same technology in a car half the price, the value goes down dramatically. They have to always be one-upping the mass market." For high-end car buyers like Shien-Lin Garrett, in-car connectivity has become a must-have. The mother of four from Laguna Beach, California, uses apps on her iPhone to keep track of her busy schedule and entertain her kids. She uses the phone's speaker function to make calls after struggling to link it to her Audi A4. "The iPhone is my life; I run everything on it," she said. "The only time I actually have to talk on the phone is while driving." Mercedes' Comand Online package costs 3,070 euros ($4,493) on the C class, including voice-recognition software and a system to monitor speed limits. The offering allows unlimited Internet browsing while the car is stationary but restricts access to data while driving to avoid distraction. Mercedes plans to roll out the system to other models in the future, said Frank Bracke, a spokesman. Mercedes is also experimenting with new ways to interact with the increasing amount of data in cars and showed a concept vehicle last year that tracks the driver's hand movements on a screen located on the center console. BMW is experimenting with filtering data based on moods, such as selecting music within a range of emotions spanning from joyful to hopeless. In the real world, BMW plans to follow Audi with live traffic data later this year. It's adding other gadgets, including a full-color display on the revamped 6 series this year. It introduced a smartphone app at the end of 2010 that allows users to lock their car and turn on the heat remotely. The company also set up a $100 million venture-capital unit to buy stakes in companies offering transport-related businesses like the MyCityWay guide service. BMW is likewise using apps to prepare the groundwork for its upcoming line of electric vehicles. Last week, it introduced a mobile phone application that determines whether a user's transportation habits are compatible with electric vehicles. For people ready to spend more than $40,000 for a car, comfort and convenience are important, and vehicles need to fit into today's networked world, said Johan de Nysschen, Audi's U.S. chief. "Customers are accustomed to having these connectivity benefits in their everyday life," he said. "There's no reason why we should imagine that when they get into their car suddenly they might have to be isolated from what's happening around the world."